If you asked me what I like better, cooking or baking, my answer would automatically be cooking. I like to bake. I like to mix things together and try fun and new recipes, but quite honestly? Baking has always intimidated me. Sorry for this blurry instagram photo. My computer wouldn't let me edit it for the life of me. 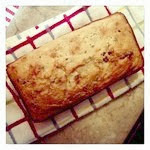 I always try to come up with a recipe on my own like a new muffin or a quick bread. It always seems to fail. I'm fine with knowing that I feel the most comfortable cooking and I know I'm a better cook than a baker, but...damn. I was really in the mood to bake something new and totally off-the-cuff today. And a bigger sense of determination settled over me; whatever I make, IS going to work! I looked in my pantry and found an unused bag of chopped pecan pieces from Trader Joe's that I completely forgot I had purchased. And for what? I couldn't recall for the life of me. I knew I wanted to make some kind of quick bread loaf because I love them but hardly ever make them. I had dried cranberries and a good ol' ripe banana. BAM! Cranberry Pecan Banana Bread it would be! And IT. WAS. PERFECT. I couldn't believe how delicious this bread loaf turned out. Sweet and tart from the cranberries and great texture and flavor from the banana and pecans. I had a gold star moment in my kitchen. Yes I did. Did I really make a brand new recipe from scratch, off-the-cuff, and it was amaze balls?? Totally! Another cool note is that this bread is egg less. I had fun experimenting with this recipe and remembered that you can use bananas and applesauce in place of eggs. I was out of eggs, so, perfect timing. I used both in the recipe and it turned out great. It really made this loaf super moist. And the best part was that I could lick the spatula this time. This is delicious and perfect for fall. In a medium bowl, mix all of the dry ingredients together. In another bowl, combine all of the wet ingredients while first mashing the banana with a fork. Add the wet ingredients to the dry ingredients and combine. Pour into a greased 8x10 baking pan/loaf tin. Top with a sprinkle of brown sugar, if desired. Bake at 400 degrees for 30-35 minutes until golden brown. Don't worry if there is some gooey banana mash poking through. The bread is cooked through; it's the banana/apple sauce mixture. Serve warm or my preference, set aside at room temperature to cool completely.